Louvre panels are a great space-saving solution for the storage of small parts, made easier with our plastic polypropylene storage bins. These bins can also be used on a rack or trolley for easy access. The storage containers contain an anti static coating so they’re safe to be used in static sensitive environments and are supplied complete with identification labels. Louvre panels are made from steel so you can be confident they have the strength to hold all your workshop equipment. The louvred panel is designed to be wall mounted and is available in a variety of sizes to store anything between 48 and 240 units. Our panel sets are easily configurable and can be mounted wherever required in order to hold small plastic storage bins as required. Since parts bins are a key feature of many workshops and factories, our louvre boards are a common sight in workplaces across the UK. In fact, where there is a need for small item storage, these products are sure to be found. The required width of your bin board will also depend on the Linbin size you are looking to hang. With so many bin kits and sizes available, there is a lot of flexibility in how your plastic parts bin system will be configured. 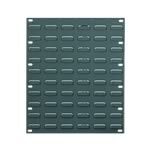 Made from steel, these bin panels are heavy duty and capable of surviving within industrial environments, once paired with a appropriate louvre panel bin, they will provide years of service. If you desire, select a variety of coloured containers for your louvre panel and you can create some funky patterns on your panel -wall art for your workshop! This can also help to keep similar objects in the same colour bins, making finding the right spare part a much quicker job. There are also other, non-industrial uses for these panels. We have seen them used in hobby rooms for the storage of beads and sewing equipment or even dressmaking supplies. 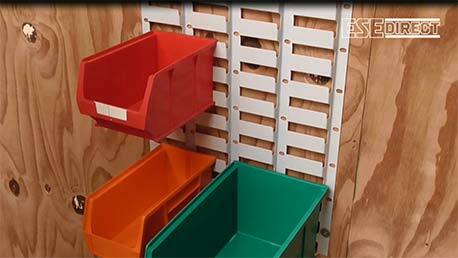 Many people have the need for space-saving small parts storage, and the fact that louvre boards can be attached to most walls, means that valuable space can be saved by stacking bins on top of each other whilst keeping each bin accessible. Arranging you plastic bins on the board is simply a matter of hanging the bins where ever you like. It can be a good idea to place larger containers for use with heavy items near the bottom, then work upwards until the lightest items are hung at the top. Of course, there is also a case for arranging the storage so that the most commonly needed parts are hung in the most accessible areas. The great this is, with there being no tools required, the bins can be very easily moved around to suit existing working practices. The system of using a metal wall panel in conjunction with plastic bins has been popular for many years. The mixture of robust steel and lightweight plastic proves to be the ideal marriage of materials. They are popular in workshops and repair centres, as well as sheds and garden rooms. Their flexible nature makes them perfect for both hi-tech businesses and home-based crafting. Planning and turning a wall from wasted space to somewhere that can be used to store small parts is very simple. The first step is to measure the wall and select a louvre board that will fit. Next, this panel must be securely fastened to the wall, normally with screws. Depending on the wall material, rawl plugs may be required, and if they are to be hung on hollow walls, then specialist securing could be needed. Once adequate mounted, the plastic bins can then be hung and filled with items. 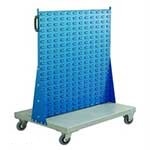 As well as wall mounting, we also offer louvre panel trolleys. 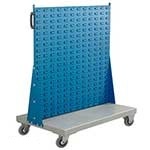 These behave in the same way as the static boards, but can be moved around a workshop. As well as the added bonus of mobility, they also offer double sided storage, with both sides of the panel able to be used hang bins. 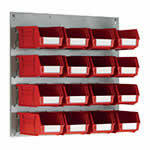 The extra flexibility offered by mobile small parts storage is obvious to anyone required to work in several locations. 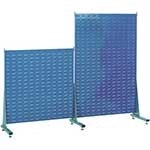 The ability to relocate the panel sets greatly reduced the time it would take to repeatedly journey backwards and forwards to a single location. In addition, we also sell louvre panel cupboards, where the back of the cabinet is slotted in order to place the linbins within it. These offer extra security, as the doors can be locked when not in use, preventing unauthorized access to spare parts. 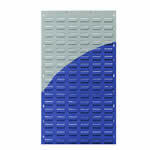 See our range of storage bins for use on these lovely louvre panels.